Net worth, the yard stick for comparing financial success is a loosely defined term (irritatingly so to our brains). 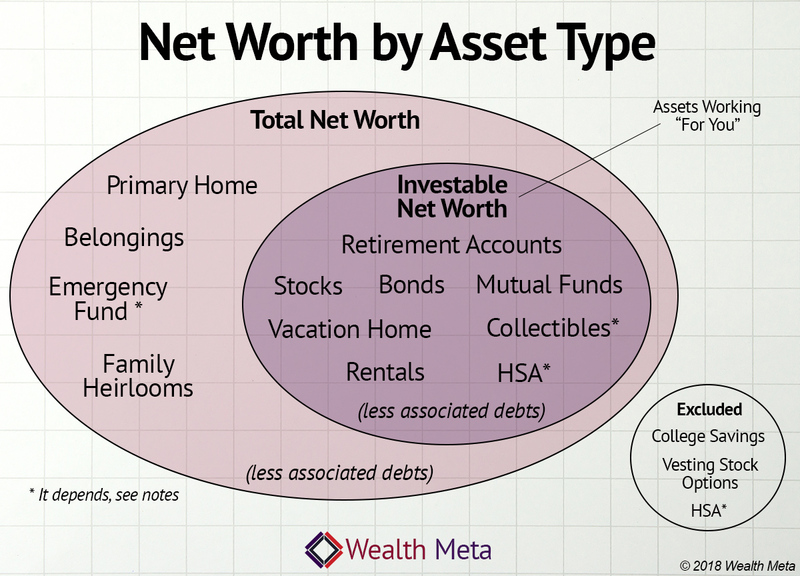 See our diagram for the break down of "total" vs "investable" net worth. After you read this you'll be able to cut through the TV / magazine / cocktail party net worth jibber jabber and use the term correctly. April 30, 2018, 11:03 p.m.
April 14, 2018, 8 a.m.
First there is your Total Net Worth: everything you own, minus debts. Total net worth is the ultimate way to “keep score” in a capitalistic society. If you died tomorrow and your Will said all the money would to your kids, they would inherit your total net worth. This is all your retirement accounts, home equity, belongings, cash box in the attic, etc. Total Net Worth is the ultimate objective measure of financial success. It is a number you need to understand about yourself in order to make smart investment decisions. Investable Net Worth is a subset of your total net worth. It only counts the money you’ve setup to grow and work for you while you go about your life. Another way of defining it is your overall investment portfolio. Investable Net Worth is typically made up of things like mutual funds, etfs, stocks. It is stored in a variety of places, retirement accounts (401(k), Roth IRA, etc), banks, pension funds, etc. For the purposes of saving for retirement, when we talk about net worth, it is your investable net worth that matters. There are things in your total net worth, like family heirlooms, or even your primary home that you can’t sell a small fraction of to pay for living expenses. So, your house and your great grandma’s ring go in total net worth, but not in investable net worth. Some things are not as clear cut, like your emergency fund, HSA account, or your vacation home. It is up to you how to categorize those assets.
? - There are a few ways of looking at this. Some people keep a cash account for emergencies and exclude it from their investment portfolio. Others keep a cash position in their portfolio for this purpose. Still others count assets they can easily sell off tax free (for example a Roth IRA account), but pad the available balance mentally in case the market melts down(-40%). This latter idea is likely not FDIC protected and the most risky. Except…. if you have it paid off this is a huge cushion in retirement as you could downsize at some point. So maybe put the % you plan to downsize into a ‘real estate category’ to reflect that allocation. A vacation home acts as an investment for tax purposes. People with vacation homes may not realize just how big a chunk of their money is invested in real estate in terms of overall asset allocation. Do you view it as an investment you’d sell for the “right price” or as a personal belonging you couldn’t bear part with? If you can’t sell it, it’s not worth the paper it’s printed on, at least right now. Valuing a business is complicated to say the least. For starters there is liquidation value, cash flow valuation, gross revenue valuation. No, if you are planning to spend most of your balance on medical expenses or it is in a cash like account (not invested, just there for emergencies), consider this already spent. Yes, if you invest the balance and hope to to withdraw against it like a retirement account after age 65. The NWD has attributes of a stock tracking app in that it supports publicly traded ticker symbols like stocks, ETFs, and mutual funds. It also handles offline assets like private funds, cash accounts, or even a baseball card collection. Making the tool comprehensive was important to us because a person’s net worth is never going to be as simple as a few stocks and ETFs. The NWD can do everything mentioned above, plus anything else you throw at it. If it can’t let us know and we’ll build in a feature to support what you need. 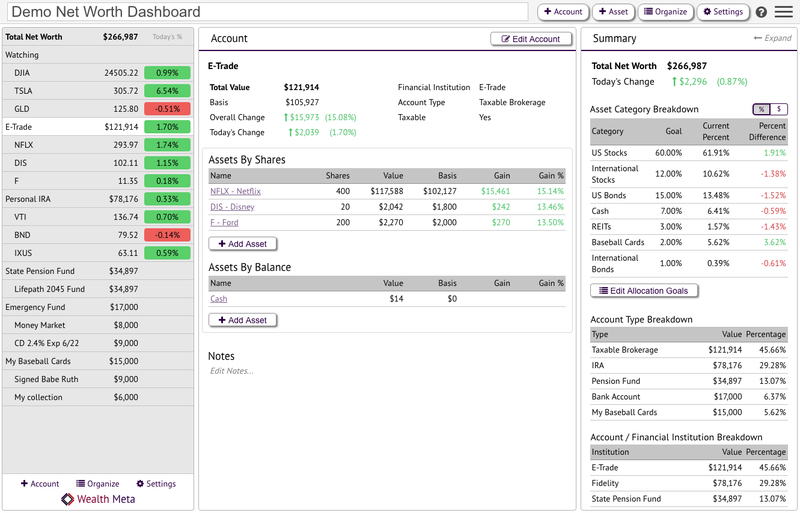 Start organizing your finances with the Wealth Meta Net Worth Dashboard today.